Martello House is an exclusive, newly renovated 8 bedroom private villa located on a ridge overlooking the exclusive Royal Westmoreland golf course and with the turquoise blue waters of the Caribbean Sea in the distance. The location provides a peaceful and relaxing retreat with fantastic views that can be enjoyed from the infinity pool, covered terrace and private balconies. The property is surrounded by lush tropical gardens and a long driveway leads you to the entrance of this beautiful villa. Martello House is laid out over three floors and offers eight bedrooms plus a nursery bedroom as well a cottage, and ten bathrooms. Spacious, beautifully styled and fully equipped, the villa offers guests all of the privacy and security that is deserved and required while on vacation. Outfitted with a large kitchen, two smaller kitchenettes, enchanting living and dining spaces, inviting pools and terraces, a state of the art media room and games and snooker rooms, all possible needs and wants are met. On entering Martello House you step into the brightly decorated and breezy living area – a vivacious and welcoming threshold for the rest of the residence. The room is furnished with comfortable couches and decorated with ornaments, prints and paintings that enhance the room’s lively character. Positioned between the casual elegance of the living room and serenity of the pool is the outdoor terrace. This lounge area provides a pleasant place to enjoy the view of the Royal Westmorland Golf Course and the Caribbean Sea from the comfort of patio couches and armchairs. The sweeping pool terraces wrap around the entrance and lower floors of the house. A long infinity pool creates a luxurious and soothing setting for the dining and living areas, and compliments the exquisite views. A staircase from the upper deck takes you down to a plunge pool from which there is a lovely view of the property’s gardens. Just off from the living room is the air-conditioned media room, with a 50-inch cable TV, DVD player, surround sound and multiple music options and movies.The audio facilities available include Internet radio (that encompasses UK, US and local radio), Spotify and a hard drive with an abundance of music on it. The video services available include a movie server that hosts over 3000 movies and TV programmes. On the lower level of the house, the snooker room is where friends or family can gather for a game of pool or a round of darts, while kids can play just next-door in the games room. A professional pool table, table football, table tennis and air hockey are all available for guests to enjoy. This spacious, air-conditioned room features a TV, a small kitchenette and ample comfortable seating. Equipped with a small fridge, wine fridge and a sink, the kitchenette makes it easy to enjoy an evening in this room with all the necessary amenities. Next door is the fitness room with treadmill, cross trainer, stationary bike and free weights. Martello House offers seven guests bedrooms with ensuite bathrooms in the main house plus a guest cottage with the eighth bedroom. On the top floor is the master bedroom, furnished with a king size bed and featuring a TV, a large balcony plus a nursery bedroom with a queen size bed. Bedroom 2 is also on the top floor furnished with a double bed and TV. Bedrooms 3 and 4 are on the main level, both furnished with TV’s and one offering a queen size bed and twin beds in the other. Three bedrooms are on the lower level, two of which have a private sundeck and the third opens out on to the plunge pool and offers a kitchenette. The guest cottage is near the main kitchen and offers privacy without removing guests from the facilities and amenities in the main house. This bedroom is furnished with a queen size bed. Martello House is a “smart home” with a touch screen controller on every floor and a remote control in each room from which lighting, audio and video services can be managed. This state of the art audio/visual system is accessible in the media room and throughout the house, the whole of which also has access to Wi-Fi. The house is staffed 6 days a week by a dedicated housekeeper and laundress. A cook is provided with 6 bedroom bookings and a chef is provided with full house bookings. For Winter and Christmas full house bookings, a butler is provided. Guests have access to Beach Facility located at The Fairmont Royal Pavilion Hotel. 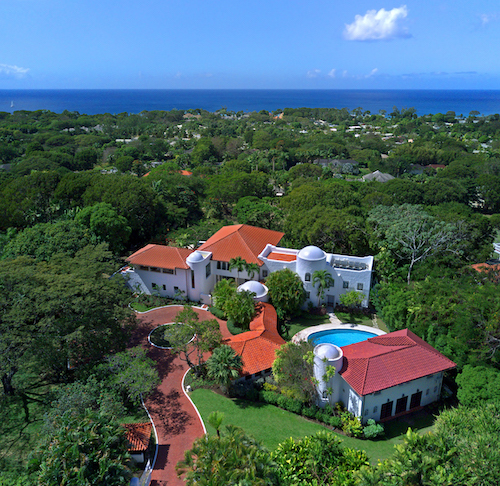 Originally designed by the late Oliver Messel this exquisite 5 bedroom villa has been extensively refurbished and now includes a separate newly built 3 bedroom cottage, beautiful interior decor offers guests a unique feeling of the Old Colonial style of living in a truly stunning beachside setting.